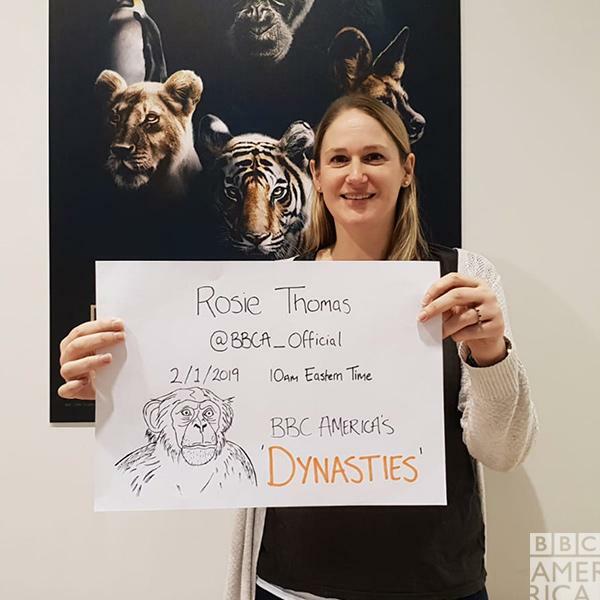 Hello Reddit, I am Rosie Thomas, a producer/director at BBC Studios Natural History Unit and I spent the past four years producing the Chimpanzee episode of the Dynasties series. I have worked on award-winning productions including Africa and Monkey Planet. I have traveled all over the world filming a wide range of different animals, from elephants in Central Africa to lizards in Tasmania, but have spent a large part of my career filming primates, all across the globe. I spent the last two years filming a single group of chimpanzees in a remote part of Senegal for the Dynasties series, now premiering Saturdays at 9pm ET on BBC America. Thank you for all your questions, Reddit! See you next time! No. And no. They don’t throw poo! Someone else asked me this question, and I think the answer is that chimps have been seen to throw poo in captivity, but they don’t do it in the wild. Greetings fellow employee from across the pond! Here in the newsroom in London, we'd be keen to know... do you feel much pressure working on a show following in the footsteps of other big BBC docs like Planet Earth and Blue Planet? Good luck with the show! No, I don’t think we did feel any pressure on this actually because what we set out to do was so different that I don’t think we ever felt any pressure. There’s very few similarities between Planet Earth II and Blue Planet II, and Dynasties. They’re different types of storytelling and they’re different types of program. And I think we all work together here in Bristol, so some of my great friends made Planet Earth II and Blue Planet II, so I think that we all support each other. There’s always a healthy dose of competition. You want to make great films and be as successful as those who came before you, but I think what we were doing was so different that I never felt any sense of comparison between us and them. And I think, as a result what we achieved almost complimented those types of series because we brought something that’s a bit different into the mix, and that’s always a good thing. Did you learn to understand any of the chimpanzee calls while you were living with them? I heard a story on NPR about how different groups of primates that live in the same area can learn to understand and react to the warning calls of other primates, and that even non-primate animals can come to understand and react appropriately to different primate warning calls. The story I heard was that a researcher was alone in the jungle one day when the group he was studying began to warn about a panther in the area, and he eventually realized that he was being stalked by a panther, and that he was also unconsciously understanding and reacting to the actions of the primates he was studying. It was one of those kinds of stories where you stay in the truck, in the driveway, until you hear the end of the story. In brief, I think all primates have their own set of calls and most scientists studying them know, or are learning the calls of them. What was extraordinary about this group of chimps, was that the research assistant Michel, could not only understand what all the calls meant, but he could identify the calls of individuals. Like the voice of a human, he would know when a call was in the distance, which individual was making that call. By the end of it, I could recognize about 2 individuals calls. How he does it, I have no idea - but if you could hear chimps in three different directions, he’d always know which way to go because he could hear David. It was just extraordinary. In terms of calls for different things, you’d know when a call was about to lead to a display or a fight or when someone was a bit scared or when someone wanted food from somebody else. In general, I got a good idea of what was what. In terms of identifying the individuals, I’d have to be there a lot longer. I got Beau quite quickly, because he had a sing-song quality to his voice. What unexpected ways are the chimps like humans? And what ways are they not? That’s a tough question. I think you can’t help but watch chimps and see similarities. You can’t help it. That was part of my job - to try to not impose too much anthropomorphism on them and let them show their thoughts and feelings to us, without us thinking about what they should be. I was always amazed by their dexterity and how well they were able to use tools and fish for insects. They also use spears - they make these spears. They create these spears by breaking off branches and sharpening the ends with their teeth, and they use them to flush out bush babies in tree holes. The way they were able to make these things and use them always amazed me. The finesse with which they were able to groom each other and the delicate nature of the way they would do that. The way their fingers moved, you look at their hands and they look just like human hands. I think they’re a lot cleverer than people give them credit for. There’s often a lot of planning going on in their brains. How accurate that is I don't know? That’s just my opinion. I was always quite amazed by the actions they were doing. It always felt like nothing is ever done for nothing. There’s always an ulterior motive behind every action. I always thought that was quite fascinating and human like. In which ways are they not like us? Lots. I think the way they deal with things is very physical - we obviously have wars, but that’s often the last resort. They tend to get physical quite quickly sometimes. The way they respond to rain is quite human-like - they’ll try to get out of it, and they’ll build a little nest and try to shelter under it - and find shelter under the branches which is quite human-like I think. They can read the fires as well which I think is extraordinary. It’s amazing. They were always so calm, I’d be standing there thinking “Aahh!! There’s this big raging fire coming this way”, and they’re just sitting there calmly eating their grass and getting on with their day. And I’m thinking “What are they doing? They’re going to get burned!” And they just calmly get up and saunter around the corner. The scientist always said to me, if you ever see fire coming towards you, follow the chimps because they will get you to safety. And I didn’t believe it! And on the few occasions we saw fire and chimps in the same vicinity, we would follow them, and she was always right! I’d worked with chimps before, so I kind of, sort of knew what to expect when I first saw the chimps in Senegal. But the habitat the chimps are in in Senegal is so different to anywhere I’d filmed chimps previously, so that was what struck me more - the heat and dryness of the location. I thought I knew what it was going to be like, but that really surprised me. The chimps - they have been studied for 20 years by the scientist, Jill Pruetz so we kind of just went with her, and we worked much further back than we needed to be to get them used to us being around. We worked with their protocols and slotted in alongside them. They were fine - never really bothered by us at all. I just love working with chimps so I find it really amazing. Every day was amazing. What animal would you say you’ve found the most fascinating to see live in person? Oh crikey - I’ve seen a lot. I mean chimps are extraordinary animals, but I have to say big cats are amazing - they’re so beautiful and graceful. So lions and cheetahs - I’ve never seen a tiger. I’d love to see a tiger! But lions, leopards and cheetahs are just incredible. I should say a monkey of some sort - but there are so many primates and I can’t choose an individual. The gibbons are lovely - and because they live so high in the trees, they’re difficult to spot, so seeing gibbons in the wild is such a lovely thing to be able to do. Was it a tough life out there? In all honesty, it wasn’t too tough. We made that decision because we’d had to spend such a long time there. I made the decision to take a slightly longer filming day, and we stayed in the local town. We had a drive of half an hour to an hour, at the beginning and end of the day to stay in a local town near the chimps’ range. In large part, we had to do that anyway for electricity because in the scientists’ camp, she doesn’t have any electricity, and we needed to charge all our batteries at the end of the day. So we had a comfortable bed at the end of the day – our days were long. We didn’t rough it as much as I have done previously shooting chimps, but there were good reasons for it. What are some of your favourite moments that happened during the filming but were left out of the final series for one or the other reason? That’s a good question! Because we had to fit 2 years into 50 minutes, there’s quite a lot of behaviors we caught on film that didn’t make it into the final film. The bits that were left out that were my favorite were all the really funny bits - like David would climb a tree to get some fruit, and the tree was just too small for his weight, and the tree would just bend over in half and crack, and he would land on the floor and then look around like “Did anyone see me?” and then he’d scuttle off and find another tree. They didn’t really fit in the context of the film. We did capture some really amazing stuff like nest-building at night which often you can’t film with chimps because they live in forests where there are forest elephants and it’s too dangerous once it gets dark and we have to leave before they build their nests. But here we were able to follow them up until they built nests, and just one trip we stayed up to film them with a special camera until they built their nests. It felt like getting special insight into their world. That was really lovely but unfortunately we had too much content for that to make it in. What was the most shocking thing you saw? I don’t know if it's the same thing, but the most upsetting thing I saw was when David was hurt and had been beaten up - it was shocking to me – the brutality of it. But definitely the most upsetting thing I’d seen in my 14 years of making these types of documentaries. I think part of that was how close we’d gotten to the group, so to see him in that state was awful. And we genuinely thought he’d died, because he disappeared for a few days, and that was really tough. Also, their fights - it always shocked me because of the aggression towards each other. They can be really lovely to each other one minute and turn and hurl a rock at each other the next minute - it was always quite shocking when the fights kicked off. Do the chimps, or other Apes, ever pose a risk to you and the crew? I just felt in any kind of danger around them at all. I always felt like I was in such a privileged position to be able to be there watching them. I never felt worried. I’ll be honest: I don’t know the exact amount because I don’t know what our final filming total was–I’ve tried to avoid finding out. It’s quite a small percentage actually. We film a lot of stuff every day. Especially on this kind of series where you don’t know what will happen–you end up filming a lot more because you don’t know what will be important the next day. As we went through filming, we started to shoot less and less because we knew which storylines we wanted to follow. But because we were filming 32 chimps, any individual could have come forward as an important part of David’s story. But as for the numbers, I don’t know, and I’m not sure I want to know. Do you interact with the chimpanzees at all or is the behaviour we see on film their natural behaviour? We don’t interact with them at all. They know we’re there, but they just get on with their day to day lives, and that’s a result of us working with the scientist’s protocols. They’re so used to the scientist, that we just stayed there and hung back - we wouldn’t interact at all. What is what drove you to your career? It was such a long time ago, I can’t quite remember. I think - my dad worked in TV - a completely different field of TV. He made childrens’ television. From that I kind of learned about the types of jobs involved in TV and making TV so that helped my understanding of what it was like to make television programs. But my fascination from when I was a teenager was about animals and animal behavior, so that’s what I studied at university. I studied a masters degree at the Natural History Museum in London and from that, I thought I’ve got the background in science now but I needed the grounding in television. So I worked, doing work experience in various different companies and from there moved into the wildlife/natural history genre. I kind of knew I wanted to marry up the two different things from relatively early on. My god–there were SO MANY HOURS–DAYS–spent not doing very much. I remember the longest time spent waiting for the group of chimps–We’d reached them before dawn, so we’d be with them by half 5, 6 in the morning. They’d be really active until maybe 8 or 9, and then they’d be like “oh it’s a bit hot now we’re going to have a sleep now,” and they’d go have a sleep behind a bunch of vines. The longest we waited for them to reappear was NINE HOURS. You can’t do anything. You just have to sit there. They can come out at any time. You can’t leave, go have a nice lunch and come back, you’ve got to stay! And you can’t talk very loudly because you don’t want to disturb them. So basically we listened to a lot of podcasts, because you had to be so quiet. Occasionally we’d have naps, because the days were so long and we were so tired. So one person would have a nap while the other was awake. But yeah, podcasts were mostly what got us through. The best podcast we listened to was Serial - This American Life was another one we listened to a lot of. I would say the BBC Earth podcast, but it wasn’t around then. Are you familiar with the singer named Rosie Thomas? No. I knew there was an author named Rosie Thomas, but didn’t know there was a singer. I’ll have to look her up! Possible spoilers ahead: How emotionally involved does the crew become with a chimp like David? Part of the story seems like he isn't going to make it, is that over-dramatized for TV or was the crew actually worried? If he seemed to be on the brink of death, why wouldn't someone step in and get him to a rehab facility or zoo, since I'm assuming there is always a zoo looking for animals wouldn't this be a better way than trapping one? In terms of how emotionally invested we get, the answer is on this production–because we spent so much time with one group–and most of it with David–we couldn’t help but be emotionally invested in that story. When he was hurt, we filmed the beginning of that, and then he disappeared for several days and then we genuinely thought he was dead. It wasn’t something that we over-dramatized. We really thought they had killed him. We knew this group had killed previous alphas so we knew it was something that was very possible. When we found him again, the relief that we had was just extraordinary, and we were able to follow the story, and his comeback was just incredible. We were absolutely over the moon that he was alive, and then his comeback was just–all of us could not believe that it had happened! And when he was hurt, and it was absolutely awful to find him in that way and it was absolutely awful to see that happen to him, there was just nothing that we could do for him because apart from anything else, it would’ve affected the natural hierarchy and society of that group. Had we tried to do anything for him, we would have been interfering in their society which we can’t really do. More importantly than that, the scientist doesn’t interfere - it’s her study and she’s been doing this for 20 years so we can’t go against what she would normally do. Beyond that, we’d need a vet and a system to get him out of there of which there aren’t any in that that remote part of Senegal. It wouldn't benefit him to be taken to a zoo or something like that. So we can’t get involved–the scientist doesn’t get involved–and he’s still alive, and a full grown chimp much stronger than us and he probably would’ve been very aggressive if we’d tried to do anything, so apart from anything else, it would have been too dangerous.